Whether you want to stay warm, avoid the sun, or simply look fashionable, these free sewing patterns for hats give you lots of handmade options! This list includes a variety of styles and sizes. Choose from patterns for babies through adults and from summer to winter and in-between! 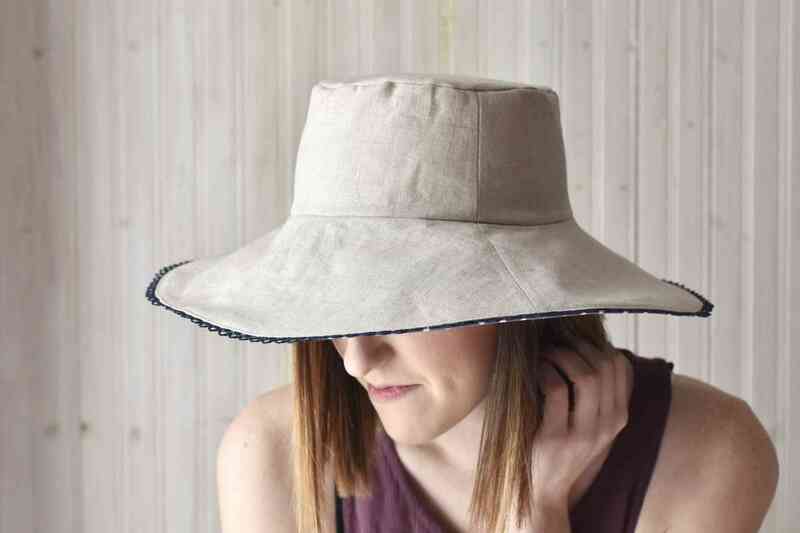 Stay safe and fashionable in the sun with this reversible linen sunhat. With all the fabrics available to choose from, plus all the trims you could use, the possibilities with this hat are endless. Plus, the free pattern comes in two sizes. Want to add a bit more flair? Embroider a fun summer saying on the brim, or pin on a faux flower! This DIY from See Kate Sew isn't one where you make the hat from start to finish, but it is a sewing tutorial. With this project, you can take an existing trucker style cap and sew on a panel of your favorite fabric. What a great way to update something old and make it more you! This pattern is perfect for young sewers or adults who need a pattern that works up quickly for gifts or charity. There's no finishing required and only a few simple, straight seams to sew! Plus, with the variety of fleece fabrics available, you can make this project all your own. This amazing hat for teens and adults features trendy faux fur on the brim and ear flaps. It's so cute and cozy! Sewing with faux fur comes with some challenges, but Erin from Sewing Rabbit share specific tips to give you success. Bucket hats are a classic, especially for kids. This free pattern from Oliver + S includes four sizes ranging from 6-12 months up to 6-8 years. You can download the instructions with illustrations in PDF form or check out the photo tutorial, which includes some extra ideas for customizing! Instead of relying on a pattern that may not fit well, this tutorial shows how to measure to get the right fit for a beret. And while it's shown for a teen, you could make it any size you want! The sample uses corduroy, which might inspire you to try a few fabrics you may not have considered for a hat like this. What's cuter than a sweet sleeping baby? How about one wearing a hat with teddy bear ears? This free beanie pattern from How Joyful will keep your little one snug and warm. The ear flaps protect your baby's ears and the teddy bear ears add some extra cuteness! This winter bonnet only comes in toddler and kids' sizes, but it's so cute, you may want to try enlarging it for yourself. The pointed top has an elf or forest fairy look to it. What could be sweeter? Both boys and girls will look adorable in this cadet cap. Craft Buds shows a few ideas for ways to customize the look with fabrics and embellishments. While the free pattern only comes in size 5, if you're comfortable with garment sewing, you should be able to adjust the size as needed. Choose a few wool fabrics and make this reversible wool beanie with ear flaps. The one-size pattern should fit like a small/medium, but you can enlarge or reduce it on a copier. Make a beanie from a t-shirt and you're recycling a old clothing item into something new! This cap is great on its own but actually works well as a helmet liner for cyclists, or even protects your head under a hard hat. Everyone should protect themselves from the sun, but it's especially important for babies who have sensitive skin. This sweet sun bonnet is a classic option for keeping the sun off your little one's face. Plus, it's ruffly and cute! While this isn't a sewing pattern, it is a great way to make a hat your own. Buy a felt hat (perfect for fall and winter!) and add floral embroidery. This tutorial includes the free floral sprig pattern, as well as instructions for stitching on a felt hat. You could also use this pattern and tutorial for customizing a hat you sew yourself!